Life or everything is a dots game of connecting dots. Peolpe like the game Connect the Dots, to see the underlying pattern or picture. We observe some dots (shapes) and create our own dots. Every one connects in whatever way he wants and creates shapes. We all create our unique solutions. Meaningful Patterns and Meaningless Noise are two sides of the coin, and both will exist in pairs. Connect the dots, also known as dot to dot or join the dots is a form of puzzle containing a sequence of numbered dots. When a line is drawn connecting the dots the outline of an object is revealed. "connect the dots" can be used as a metaphor to illustrate an ability (or inability) to associate one idea with another, to find the "big picture", or salient feature, in a mass of data. A jigsaw puzzle is a tiling puzzle that requires the assembly of often oddly shaped interlocking and tessellating pieces. Each piece usually has a small part of a picture on it; when complete, a jigsaw puzzle produces a complete picture. There are more advanced types, such as spherical jigsaws and puzzles showing optical illusions. Real life problems are like incomplete jigsaw pieces with some missing and some damaged pieces. Writing a novel or reconstructing history is like trying to solve a jigsaw puzzle whose pieces are not fixed in shape, have to create the lost and damaged pieces with new ones. Somehow, they create one piece where all come together to form the complete picture. Each person creates their own and so we have so many different versions of history. Not every puzzle is intended to be solved. Every chaos has an order hidden in it. What we see as a chaos, is actually driven by a very disciplined and dedicated order of things. Many pattern recognition algorithms are probabilistic in nature, using statistical inference. Pattern matching algorithms, look for exact matches in the input with pre-existing patterns. A common example of a pattern-matching algorithm is regular expression matching, which looks for patterns of a given sort in textual data and is included in the search capabilities of many text editors and word processors. Noise is always present in any pattern. Some dots will always be missing. Some dots are more prominient than the other. Pattern recognition like any system has two types of errors: (1) type I error rejection of a true pattern and (2) type II error recognizing noise as a true pattern. Decreasing one, increases other type of error. Apophenia is the natural universal human tendency to perceive meaningful patterns within random data. This is also responsible for superstitions and a human tendency to seek patterns in random information, leading to gambling. One variation of this is known as the "gambler's fallacy". In 2008, Michael Shermer coined the word "patternicity", defining it as "the tendency to find meaningful patterns in meaningless noise. The cost of believing a false pattern as real is less than the cost of not believing a real pattern, as natural selection will favor patternicity. For example, believing that the rustle in the grass is a dangerous predator when it is only the wind does not cost much, but believing that a dangerous predator is the wind may cost an animal its life. Nature prefers extra careful. People believe weird things because of our evolved need to believe in weird things for safety and survival. In The Believing Brain (2011), humans have "the tendency to infuse patterns with meaning, intention, and agency", called "agenticity". In 2011, parapsychologist David Luke proposed that apophenia is one end of a spectrum and that the opposite behaviour (attributing to chance what are apparently patterned or related data) can be called "randomania". He asserted that dream precognition is real and that randomania is the reason why some people dismiss it. Pareidolia is a type of apophenia involving the perception of images or sounds in random stimuli. For example, hearing a ringing phone while taking a shower. People around the world see the "Man in the Moon". In statistics and machine learning, apophenia is an example of what is known as overfitting. The model overfits the particular data or observations rather than fitting a generalizable pattern in a general population. Superstition is a big part of our everyday lives, as our brains are pattern-recognition machines that connect the dots. Superstition is believing something is real when it is not (finding a non existent pattern). It is also not believing something, which is real. Fortune-telling and divination are often based upon discerning patterns seen in what some people would consider to be meaningless chance events. For some, they are real patterns telling us some thing. This can be applied to astrology os seeing patterns in the sky. 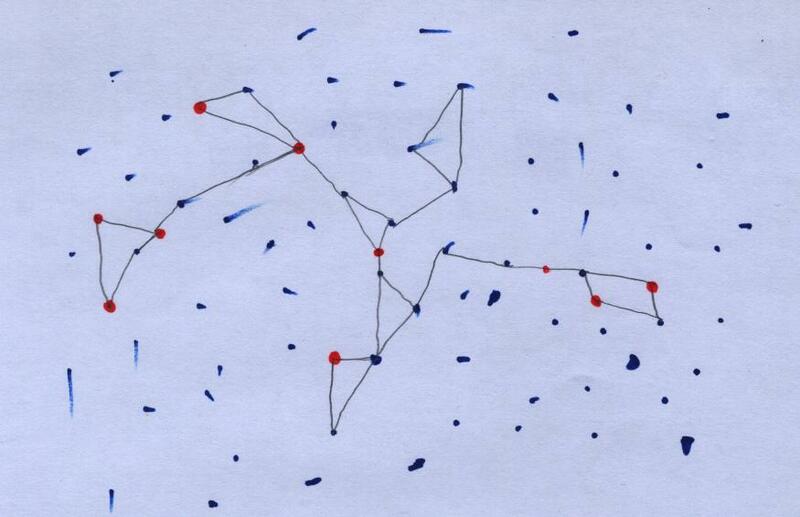 For non believer, it is just random dots representing 3D stars in 2D surface. Brain can not distinguish between true and false patterns. So, accept Superstition is a part of life, but try to reduce it as much as possible with logic and reasoning.